Whilst growing up I HATED mushrooms, I thought they were slimy and gross and I constantly turned my nose up at them. Somehow I managed to get through most of my life without having to touch a single one… until I was given them at my boyfriends house (uh oh). As I was trying to make a good first impression, I quickly gobbled them all down and to my pleasant surprise thought they were actually really delicious. 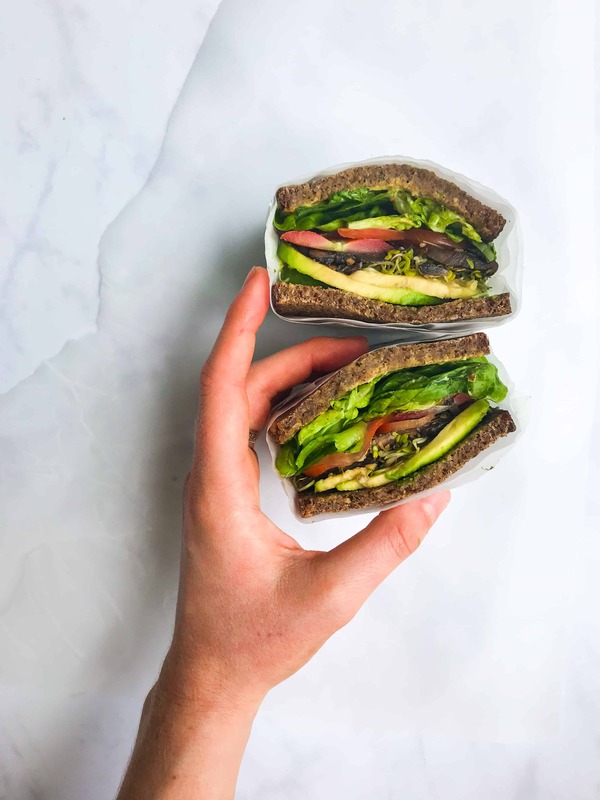 This MLT sandwich recipe is my apology to the humble mushroom – you didn’t deserve they way I treated you and I am sorry. I hope you can find justice in this sandwich because I definitely have – its pretty damn tasty. Over the last 300 years sandwiches have become one of the world’s most popular lunchtime foods. They were first invented by John Montagu, 4th earl of Sandwich who, legend has it, asked his servant to ‘sandwich’ his roast beef between slices of bread so he could still enjoy it whilst playing cards. How ingenious. Unlike the greasy BLT, my MLT sandwich is packed full of goodness. Mushrooms are super nutrient dense and are particularly great for vegetarians and vegans as they are one of the few plant-based sources of vitamin D. As well as vitamin B and copper, they also contain a powerful antioxidant called selenium which helps boost the immune system and prevents tissue and cell damage. If you are on a budget, mushrooms are your best friend. There unique rich flavour is perfect for meat-free meals as they leave you feeling full and satisfied. 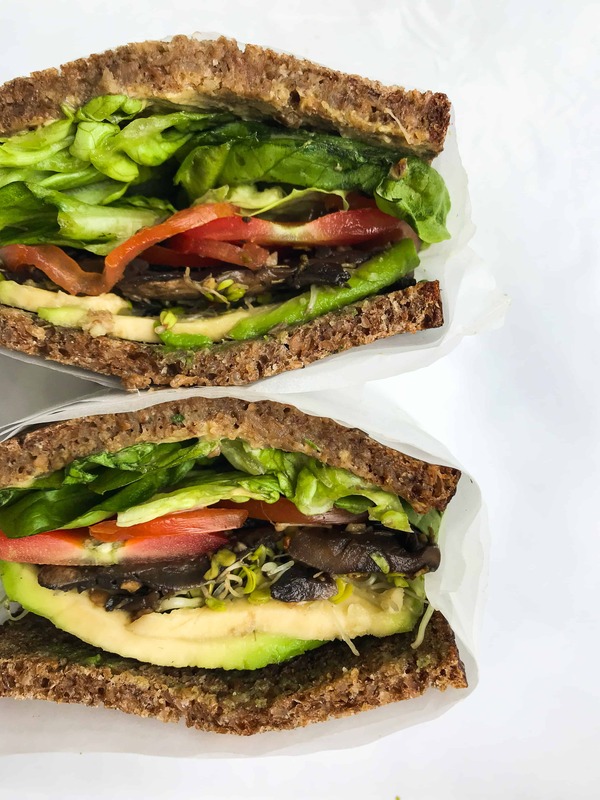 The marinated mushrooms recipe in this MLT sandwich is a great one to learn as they can be used in a multitude of dishes. Try them on salads, with your full english, with pasta, as a side dish, or my favourite way – on top of avocado toast (does that make it less basic b*tch?). 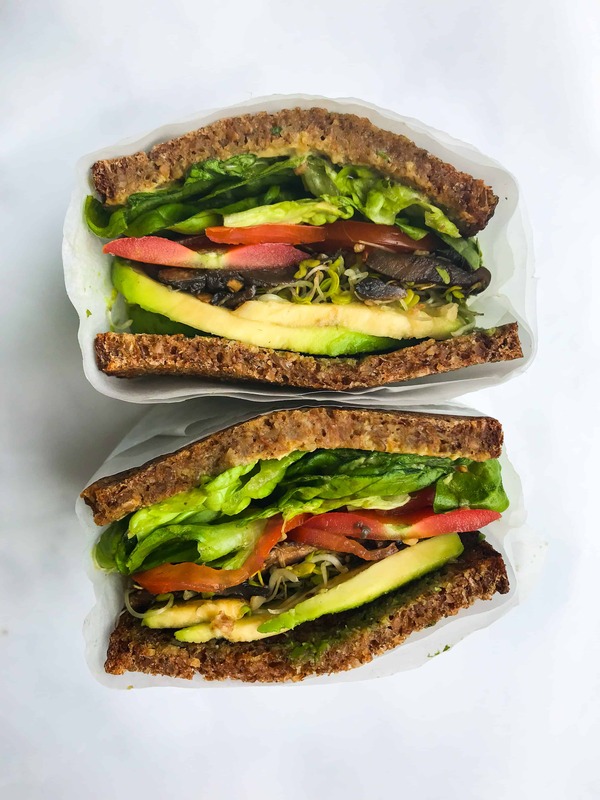 Salty marinated mushrooms with crisp lettuce, sweet tomatoes and crusty toasted rye bread - Its a sandwich combination made in heaven! Meat-eaters and vegans alike won't be able to keep their hands away from this one... Super nutritious, vegan, GF option, paleo option & healthy! In a small bowl combine the balsamic vinegar, soy sauce / tamari, honey / maple syrup, rosemary, thyme, garlic and salt. Add the sliced mushrooms into a small frying pan over a low-medium heat and pour over the marinade. Stir well to combine. Allow the mushrooms to cook for 7-10 minutes, stirring at regular intervals, until the mushrooms are soft and all the liquid has evaporated. Remove from the heat and set aside. 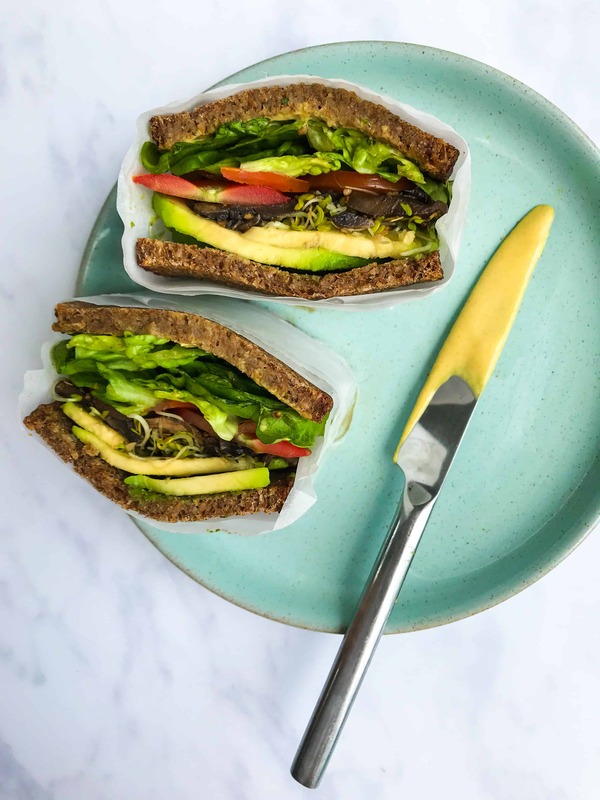 Liberally spread the wholegrain mustard onto one half of the toasted bread before layering the tomato, lettuce, avocado, mushrooms, cress and second slice of bread on top. Cut the sandwich into two with a serrated knife and serve immediately. This MLT sandwich is best consumed immediately after assembling. To make in advance prepare all the components separately, refrigerate and assemble just before eating. I like to use toasted rye bread for this recipe as it gives the sandwich a great crunch. If you aren't such a fan of rye bread good alternatives would be sourdough or a good quality wholemeal bread (make sure you check the label for no added sugars, preservatives or emulsifiers!). This marinated mushroom recipe is a great one to have in your repertoire. I like using them on salads, jacket potatoes or to top a crusty slice toast for a quick and tasty breakfast. GF option - if you can't tolerate rye use a gluten free bread, my favourite is this one. Haha! Maybe you should try this recipe! It might sway you…..